A drama delving into the story of China's so-called "leftover women" is touring the United Kingdom this month. 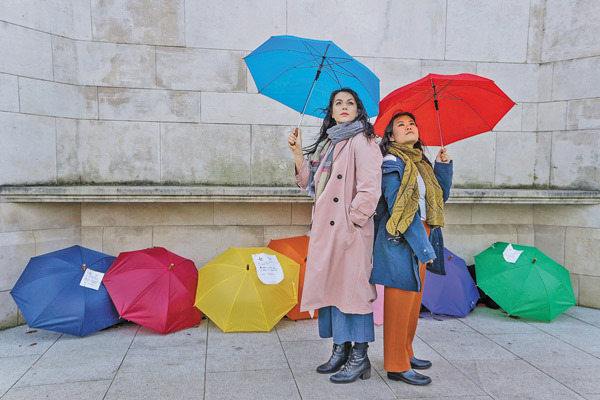 Under the Umbrella, which was written by Chinese playwright Amy Ng and is jointly set in the British city of Coventry and in Guangzhou, China, tells the tale of Wei, a young Chinese woman who is living and studying in the UK. As Wei, who is single, approaches her 27th birthday, her grandmother and mother fear she will be labeled a shengnu, or "leftover woman", and begin to search for a suitable husband for her. The play is based on an original idea by Lian Wilkinson, who approached Ng. Wilkinson is Chinese but was adopted by a British family and her adoptive mother was also a Chinese adoptee. On one hand, the traditional preference for having boys has been rooted in Chinese feudal society for thousands of years, and at times led to an imbalanced male-to-female ratio. On the other hand, the financial and social status of women - especially educated ones living in urban areas - has greatly improved over the past few decades, which has seen them raise their criteria for selecting a spouse. As a result, this has made it harder for them to find a suitable "Mr Right". "Lian really wanted to get into the gender issues of China and how women are valued," Ng says. While the practice of arranged marriages has been illegal on the Chinese mainland since 1950, matchmaking markets, where parents often become involved in searching for a suitable mate for their offspring, are still common. "In big, public parks, middle-aged parents display a profile of their children on umbrellas so the other parents can search around and try and find a match," Ng says. The playwright says the story looks at how women are valued in both British and Chinese cultures, with the dating app Tinder being compared to a version of the matchmaking markets. Under the Umbrella also explores the connection between Chinese protagonist Wei and her English best friend, Lucy, while comparing their views on relationships. Despite the subject matter, Ng says the play is not directed at a particular audience and, by bridging the perceived gap between the two cultures and noting similarities, Ng hopes she has avoided presenting "exoticized" views of China. "It's about female agency and I'm hoping it's universal and will speak to both cultures. It's not just a play about Chinese people," she says. "Women are judged on both sides of the world. It's a good way to examine how societies value women and how different societies evaluate or decide the worth of a woman."